Edward Jenner (May 17, 1749 - January 26, 1823) was an English country doctor practicing in Berkeley, Gloucestershire, England, famous for his work introducing the Smallpox vaccine. Edward Jenner is alongside the likes of Joseph Lister, Robert Koch and Louis Pasteur in medical history. Edward Jenner’s great gift to the world was his vaccination for smallpox. This disease was greatly feared at the time as it killed one in three of those who caught it and badly disfigured those who were lucky enough to survive catching it. 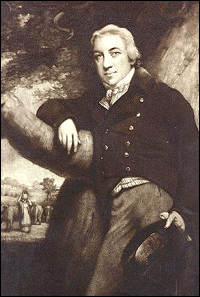 Edward Jenner was a country doctor who had studied nature and his natural surroundings since childhood. He had always been fascinated by the rural old wives tale that milkmaids could not get smallpox. He believed that there was a connection between the fact that milkmaids only got a weak version of smallpox – the non-life threatening cowpox – but did not get smallpox itself. A milkmaid who caught cowpox got blisters on her hands and Jenner concluded that it must be the pus in the blisters that somehow protected the milkmaids. In 1796, Jenner decided to try out a theory he had developed. A young boy called James Phipps would be his guinea pig. He took some pus from cowpox blisters found on the hand of a milkmaid called Sarah. She had milked a cow called Blossom and had developed the tell-tale blisters. Jenner ‘injected’ some of the pus into James. This process he repeated over a number of days gradually increasing the amount of pus he put into the boy. He then deliberately injected Phipps with smallpox. James became ill but after a few days made a full recovery with no side effects. It seemed that Jenner had made a brilliant discovery. He then encountered the prejudices and conservatism of the medical world that dominated London. They could not accept that a country doctor had made such an important discovery and Jenner was publicly humiliated when he brought his findings to London. However, what he had discovered could not be denied and eventually his discovery had to be accepted – a discovery that was to change the world. So successful was Jenner's discovery, that in 1840 the government of the day banned any other treatment for smallpox other than Jenner's. Jenner did not patent his discovery as it would have made the vaccination more expensive and out of the reach of many. It was his gift to the world. A small museum now exists in his home town. It was felt that this was appropriate for a man who shunned the limelight and London. In the museum are the horns of Blossom the cow. The word vaccination comes from the Latin ‘vacca’ which means cow – in honour of the part played by Blossom and Sarah in Jenner’s research. A more formal statue of Jenner is tucked away in one of the more quiet areas of Hyde Park in London. As a young man, Jenner also wrote about what he had seen cuckoos doing. His were the first written records to describe a baby cuckoo pushing the eggs and the young of its host out of the nest so that the baby cuckoo was the only one to receive food from its foster parents. This was only confirmed many years later but it stands as a testament to the importance of the countryside for Jenner. If he had gone to a city to further his career, would he had been in the right environment to make his famous discovery? In 1980, the World Health Organisation declared that smallpox was extinct throughout the world.